This particular recipe is by far one of the easiest recipes for quick fudge that I've ever run across. 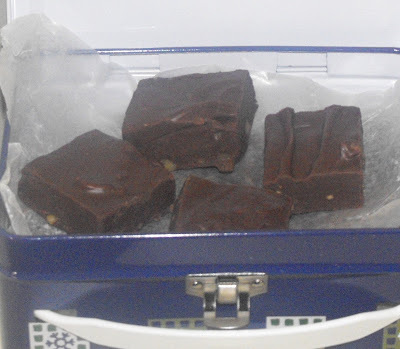 The basic fudge has only three ingredients, but it lends itself to any number of variations. This made a thin, dark, rich tasting fudge. I used semi-sweet chocolate chips, but I think it would be good with milk-chocolate chips, and probably the peanut butter or butterscotch flavored chips as well. I'd love to a layered fudge with this, and may try that later in the week. Besides the ease of this recipe, I liked the fact that the ingredients are items you can keep on hand for anytime, not just during the holidays. Chocolate chips and sweetened condensed milk may not be something you keep on hand in a really basic pantry, but I think most of us have them on hand or readily available during the holidays, at least. Don't forget to come back every day this week for more quick and easy recipes that can be used for your family or for gifts, along with ideas for packaging your goodies for giving. This sounds so good and I love the way you packaged it -so cute. This really is one of the most full proof fudge recipes out there - we turned it into truffles this year, by rolling the fudge squares into balls, and then dipping them in melted chocolate chips - yum! I love GREAT!!! and EASY!!! recipes and this one is one I think I can do with my grand-daughters. THANKS!!! I just made something like this, except add peanut butter, yum!! Thanks for sharing with Holiday Treats week. I"m giving your post a pin on Pinterest!